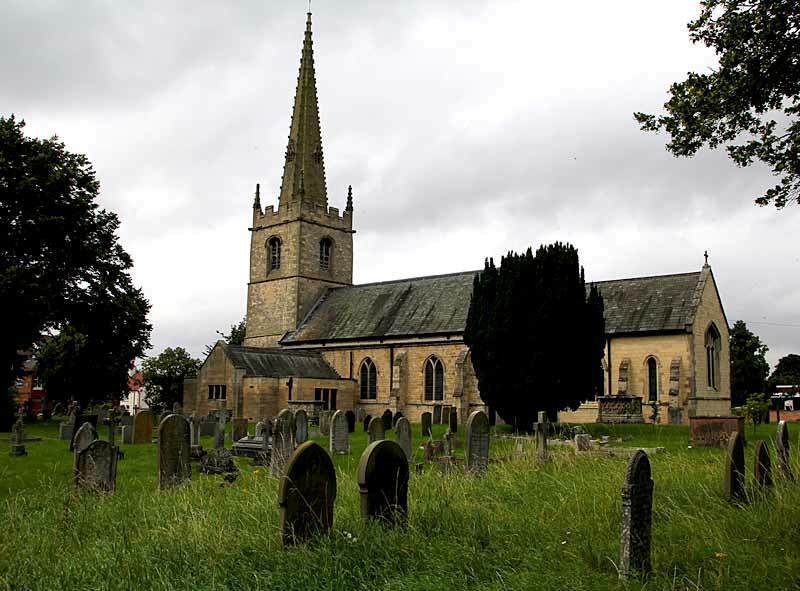 It is reputed that a Saxon church existed in Balderton but no traces of masonry have been found. The present stone church consists of nave with 4 bays, chancel, north and south aisles, an embattled western tower containing a clock and 8 bells, and an outstanding octagonal and crocketed spire. The oldest parts are the Norman north and south porches, particularly the former, which is superb and has a 15th century oak door with a carved 12th century figure of the Virgin Mary in a niche above. The lower stage of the tower is 13th century, but the upper part and spire are late 14th or early 15th. The aisles are mostly Decorated, the 13th century arcade piers octagonal with foliated capitals. The chancel has Early English lancet windows, some of which contain fragments of 14th and 15th century coloured glass. The church has a good collection of late 19th/early 20th memorial windows, several by Burlison & Grylls. The early 14th century font is octagonal with ballflower ornament. A set of medieval bench ends is remarkable, with poppyheads formed by rabbits, hounds or grotesques. The church was restored by James Fowler in 1882-3; clergy and choir vestries were added in 1964.